It doesn't make sense. Why would anyone consider two products separated by a 33 per cent price difference and a significantly smaller gap in specification and ability competitors at all? But the similarity in displacement, peak power, torque, the engine bottom-end and so forth have often brought us back to the same question. Should you happily pick up the new Pulsar 200NS or is the Duke really so much better that you should be spending Rs 35,000 more on it? We spent a few days on the bikes, in traffic, out on the highway as well as with full performance testing to find out. I believe Bajaj wanted to differentiate the two motorcycles visually as much as possible within the confines of the fact that both are naked bikes. Gerald Kiska's design language is unmistakable and the Duke 200 is very obviously a KTM. And in that respect, the Pulsar is dramatically different. Where the KTM is fat-free, hard-edged in design, the Bajaj is all muscle and bulk, visually. Where the Duke is minimalistic in its use of clearly defined lines and planes, the Pulsar is full of definition lines which it uses to create that distinctive design. Apart from the actual shape of the engine cases, to be honest, you'd be hard pressed to make a connection between the two. Finish and build levels are excellent on both and both also extensively use plastics to form the outer body panels - call them styling panels if you like. The KTM has all the cool bits. From the radial calliper mounts on the front axle to the upside down forks, the white monoshock and so forth, the KTM looks international, up-to-the-minute and very appealing as a result. I know from our Facebook page and our Twitter feed that there are those among you who do not like that hardness in the design but it's honest to its Austrian roots and I personally love that sense of visual lightness. I used to be a fan of engines, for instance, that completely filled up the engine compartment and the KTM engine doesn't. And that just makes it look in consonance with the design - though it does bring attention to the messy wiring that lies in all that air. The Pulsar is being received rather well. Like I said in the test, I'm not blown away, but I do appreciate how striking the motorcycle looks and if you mistake the Pulsar 200NS for any other motorcycle in the Indian market, you need to get your eyes examined. The specific area where I think the Pulsar qualitatively lags behind the KTM is in the rear where the KTM scores with its minmalistic LED tail lamp and a nearly non-existent rear-end design. See a KTM from behind, it looks like it's all tyre and tail light. The Pulsar has a new tail piece but the LED tail lamps look too much like the old one while their new alignment reminds you strongly of a smaller, older Pulsar which isn't, in my books, a good thing. All told, I prefer the KTM but it may not be the winner for everyone. The Pulsar is a strong design that has many, many plus points. To score it, I'd call it even since the quality, finish - the more objective parameters - are nearly on par. This is a critical part of the test because we know there's a bit of component sharing going on. The gearing for instance, is exactly the same with a minor change in the primary ratio and a more significant difference in the final drive ratio making the Pulsar a calmer, longer legged motorcycle. But all this doesn't occur to you when you start them up. The Pulsar's liquid-cooled four-valve SOHC triple-spark single cylinder 199.5cc engine - to its credit - sounds like any Pulsar engine has so far. The KTM is loud, aggressive sounding and rorty. Both engines rev quickly and easily but the KTM seems to rev a bit quicker. The KTM also makes 25PS and 19.2Nm, 1.5PS and 1.1Nm more than the Pulsar, though at the same 9500 and 8000rpm respectively. On the move, they are far more different than you expect. As you know, the fuel-injected KTM is a blur of gearchanges when you are hurrying along. The liquid-cooled four valve DOHC single charges through the revband like it's hair is on fire and in full performance testing, extracting good acceleration times from the KTM is more about timing your shifts than your throttle work in the lower gears. The carburetted Pulsar feels milder, more civil but not slow. At low to mid revs, the engine is quiet, almost completely vibration- and noise-free. You dwell longer in each gear even in full-bore acceleration though you do notice a harsh, mechanical engine note as you close in on the red line. But it does fit the role of the motorcycle as a grown-up sporty supercommuter (it's largest use cycle in India) and as a fast highway cruiser, which no doubt some of you will turn it in to. The testing days were soaked with Cherapunjee-style rainfall so I decided to test both to ensure that the numbers were directly comparable - our previous KTM test data was logged in the dry. And the Pulsar did a credible job, blurring by 60kmph in 4.33s, 100kmph in 11.67s and flashed past the quarter mile mark in 18.14s going 112.83kmph. This means the P200NS is quicker than the P220F, for example, by quite a margin - it manages to post better numbers in the wet than the P220 manages in the dry! The KTM, though, smokes it. It's over half a second quicker to 60kmph, 1.8s quicker to 100kmph, a second quicker at the quarter mile... The Pulsar doesn't show it a wheel shortly after the clutches are released. The claimed figures from the manufacturer show less difference and I'm itching to get both the bikes to test in the dry. We abandoned the top speed runs because the rains simply wouldn't permit us to go any faster in the conditions. 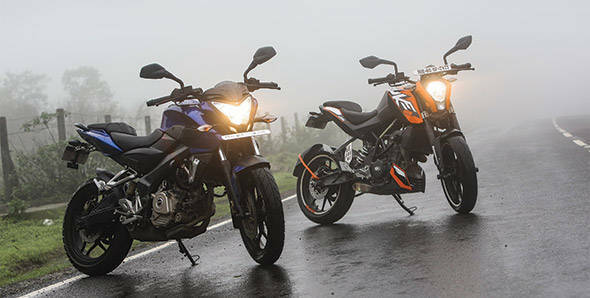 For what it's worth, given space and time, the Pulsar claims to hit 136kmph, and the KTM claims 135. Part of this difference, of course, is the weight. The Pulsar uses steel for some bits where the KTM uses aluminium and these minor differences add up to a not insignificant 9kg difference in the favour of the Duke 200. But that calmer nature does give the Pulsar the advantage in the economy department - it steadily returns 2-3kmpl more than the KTM with the overall test figure coming to 32.28kmpl for the P200NS to the KTM's 29.75kmpl. But let me be perfectly honest. In the engine department, I don't think you should be making a decision based on the performance numbers. Instead, pick the motorcycle that suits your temperament. The Pulsar is calm and civil but has a great turn of speed when you're up for it. The KTM is urgent, frantic and likes to be thrashed. It is deliciously wicked when you light the wick. It's that difference that should sway you and trust me that latter isn't everyone's cup of tea on a daily basis. I'll have a cuppa whenever I can but that's just me. If you want to have a comfortable motorcycle that won't wallow but still absorb bad roads, you can stop reading now, head to the nearest Bajaj showroom, put the money down and be done with it. The ride quality is the sharpest difference between the two. The Pulsar is a realistic motorcycle. The gas-charged rear monoshock and the front telescopic fork have been tuned to handle smartly but remain supple enough to absorb Indian roads. A relatively softer seat helps matters immensely. In comparison the KTM is like riding a rock. The seat can feel like a plank when ridden back to back and though the stiffness does wonders in the corners, the KTM gets very cross with bad roads. You feel the wheels struggling to follow the contours of really bad roads - which is fun if you're standing up and riding it dirt-bike style - but not quite as hilarious if you're sitting in the saddle doing the work of the shock absorber. That said, the KTM is a killer motorcycle to go apex-hunting. Something it demonstrated marvelously at the racetrack where it disarmed the Yamaha R15 and the Honda CBR250R without a second thought. It flicks light and quick into corners, the feedback from the stiff upside-down forks is amazing and corners are despatched with a sense of fun that suggests that the KTM is laughing its head off - it loves this stuff. The Pulsar is no pushover though. The leap forward in the chassis over the older Pulsars is significant. The steel twin spar frame and the steel swingarm work really well and despite the feeling of bulk from the overall form of the motorcycle, it's effortless to corner. But just like with the engine, it doesn't want to go all headbangy on you. It will corner happily but it'd rather smile than guffaw like the KTM. The Eurogrip tubeless tyres - which are slightly skinnier than the KTM's MRF radials - just don't have the softness needed to allow the full power of the chassis to be harnessed. Like I said at the first ride, Bajaj were clear that the largest chunk of customers would rather have it this way. And the true enthusiasts will simply switch to better rubber. On the brakes, the KTM offers more bite, power and feel but is also sharper in nature. Experienced riders will love this but newer riders will probably gravitate more towards the friendlier but still powerful brakes on the P200NS. The extra grip from the KTM's tyres, obviously, gives it the edge and while we couldn't actually test braking performance, whenever we needed to brake hard in the slippery, wet conditions, the KTM stopped far more confidently. The KTM Duke 200 is billed as a premium motorcycle. It has more features from the ones in its all-digital instruments to various chassis and engine aggregates. It has the more powerful motor, lighter weight plus crucial bits like sticky radial tyres and that hard-to-clean aluminium swingarm which make their presence felt. It's a marvelously quick motorcycle and brilliant around corners. But one that doesn't like to go slow - though if you do you might discover a motorcycle that is quite happy to trundle along at low speeds in high gears thanks to its shorter overall gearing - and absolutely hates bad roads. But it costs Rs 35,000 more than the P200NS. The P200NS is the best Pulsar Bajaj have made yet. It comes close to the KTM in performance and has better economy. What really works for it is the calmer nature and the vastly better comfort levels that mean in everyday use the P200NS will make more people happier than the KTM will. So who wins? I think someone absolutely nailed it on the head on our Facebook page - the KTM has my heart but it's the Pulsar 200NS that makes sense. And that in sum is my assessment. The KTM is the better motorcycle here, but the Pulsar does enough to prove that it is the better deal of the two. So the question really is who are you as a motorcyclist. Do you think with your heart or with your brain?